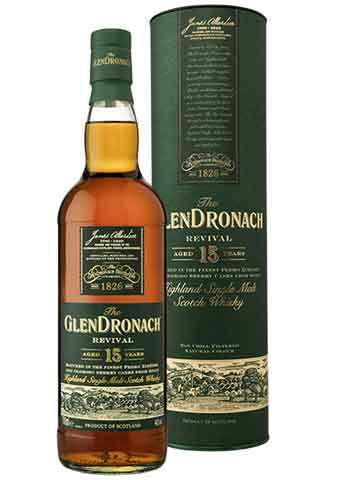 Categories: Whisky Distillery / Brand, GlenDronach, Region, Scotland, Highland, GlenDronach, Age, Aged 11 to 17 Years, Price, $100 to $150. After ceasing production in 2015, The GlenDronach Revival Aged 15 years now returns to the core range of the distillery’s line-up. The expression embodies The GlenDronach’s signature style of Spanish Sherry Cask maturation in fine Pedro Ximénez and Oloroso sherry casks from Andalucía, quietly growing in stature for 15 years in the darkness of our dunnage warehouses. In flavour, the expression offers sumptuous notes of dark fruits, rich chocolate and manuka honey with an enveloping, memorable finish worthy of this monumental malt’s history. This luxuriously sherried Highland Single Malt Scotch Whisky is bottled at 46% ABV, non chill filtered and natural in colour. NOSE : An intoxicating burst of maraschino cherry, ripe bramble and dark chocolate mint with hints of orange bitters and walnut liqueur. PALATE : Honey-glazed apricot and ripe fig with a crescendo of black cherry, angelica and muscovado. Long and enveloping finish with dark manuka honey, herbal bitters and dark chocolate.